I was invited by Karen Bourrier, the project director of Nineteenth-Century Disability: A Digital Reader to write a post about a Victorian mourning ear trumpet. 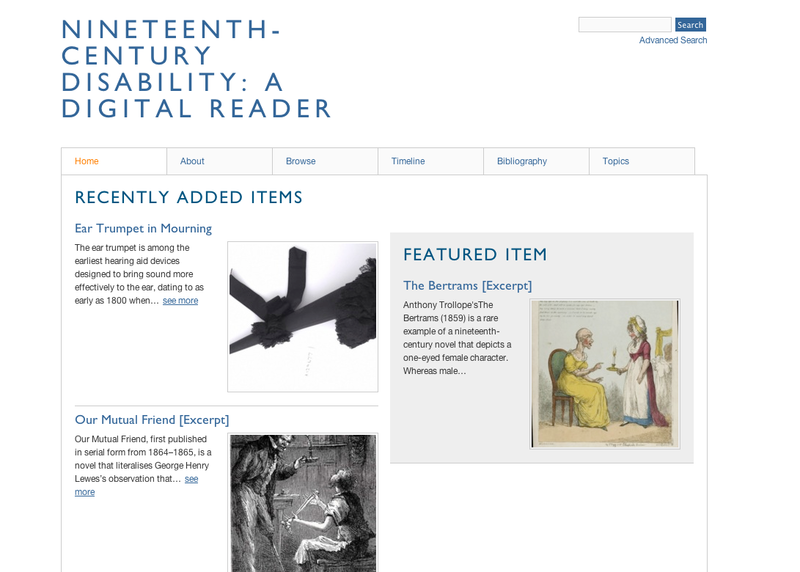 The digital reader is a remarkable project at the University of Western Ontario, an interdisciplinary approach to provide a collection of primary texts on physical and cognitive disability in the nineteenth century. It’s meant to be a free scholarly resource for incorporating disability studies into the classroom and teaching students how to work with primary sources (I absolutely love this!). The project has gotten started with a few wonderful posts, including on wooden legs, Thomas Edison’s talking books, ‘The Blind Beggar,’ and my own contribution on a Victorian mourning trumpet. The project is still under construction, with an eventual goal of posting lesson plans on how to use primary sources, a timeline of disability in the nineteenth century, and a bibliography of secondary sources in nineteenth-century disability studies. Without a doubt, Nineteenth-Century Disability: A Digital Reader is a remarkable contribution to not only disability studies, but on all subjects that intersect with ideas about the body, science, technology, and medicine.